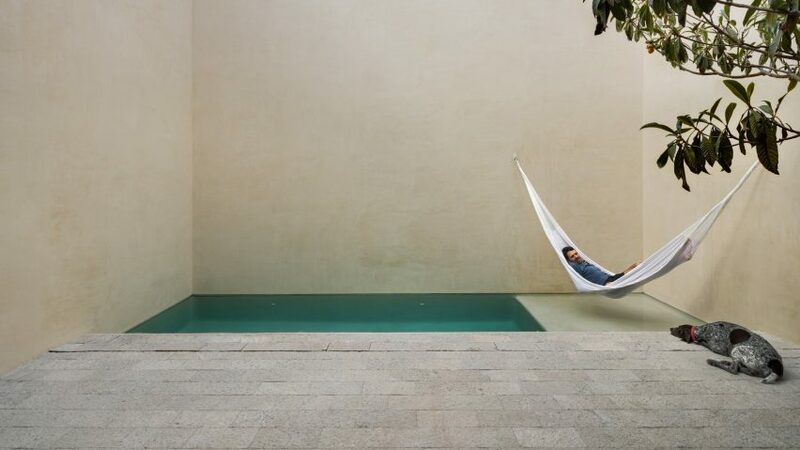 Residents of this getaway in Mexico, designed by architects Pérez Palacios and Alfonso de la Concha Rojas, can spend weekends lazing in a hammock suspended above a secluded swimming pool. 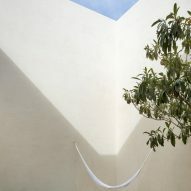 Mexico City-based architects Pérez Palacios and Alfonso de la Concha Rojas designed Casa La Quinta for a retired couple. It is located in San Miguel de Allende – a city in the central Guanajuato state. 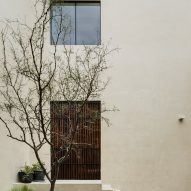 The site is penned in on the longer sides by neighbouring properties, so the architects arranged the 350-square-metre house around three courtyards to provide the residents with access to private outdoor space. 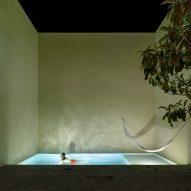 The swimming pool and hammock – which mirror a similar set up in a Mexican house recently renovated by Punto Arquitectonico – are placed in the largest of these patios in the centre of the residence. The second yard is a gravelled seating area planted with a tree, and the third is much smaller. "Having a scheme that works inwards and having no nearby views to the landscape, three void spaces were proposed in the plan in the form of patios, each one with different character, use and programme," said the team in a statement. "These voids give the project its character, producing different perception of scale to the user, a high contrast of light and shadows, spaces of silence and rest." The walls surrounding the yards include those belonging to the neighbouring properties. But all are coated in a cream-hued Corev – a paste-like finish intended to mimic the artisanal stucco traditionally used in the area – so that it is difficult to tell the difference. 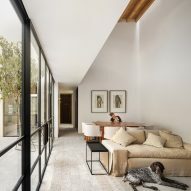 With the intention of "leaving the social space without divisions and boundaries with the outdoor space" on the ground floor, the architects placed large windows and sliding glazing on the walls of the rooms facing into the yard. 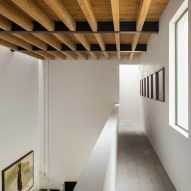 Similar materials also feature both inside and out, like the stone flooring, which is commonly used in the streets of the city San Miguel, but was cut and piled it in a different way for the house. 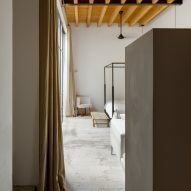 For the rest of the interiors, finishes include minimal white-painted walls and exposed wooden ceiling beams – another nod to construction typical in the area. Opening onto the largest yard, the double-height, open-plan lounge and dining room is decorated with furniture and artwork in muted tones. 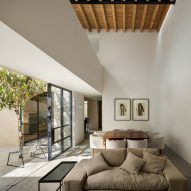 Two sofas are positioned to face a fireplace, with long pendant lights hanging from the high ceiling. 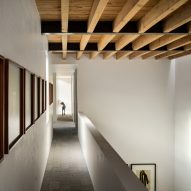 A walkway running along the top level of the room bridges the two ends of the first floor. In the kitchen, woodwork cabinetry matching the tones of the ceiling is offset by black counter tops and pendant lights. Steps lead from here down to the master bedroom suite – including a dressing room and a bathroom – which opens onto its own private yard. Two more bedrooms are placed on one side of the first floor. A third occupies the other end, along with a terrace. The rooms continue the minimal aesthetic found downstairs, with one featuring a fireplace and black steel shelving. 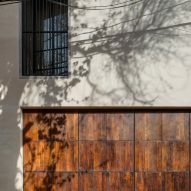 Pérez Palacios and Alfonso de la Concha Rojas designed Casa La Quinta while working together as architecture studio DCPP but parted ways prior to its completion in 2015. So far, 2018 has been a bumper year for private houses completed in Mexico, including a residence formed from a collection of black concrete cuboids and a colourful property designed as an homage to Luis Barragán.